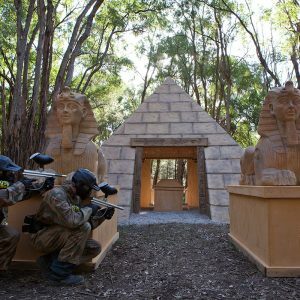 On a full day out at Delta Force Paintball you’ll encounter a range of game zones and scenarios, each with their own unique style that will test your skills and abilities. You’ll play amongst massive movie-set props with the best equipment in the industry to ensure you have the ultimate day out. But as much as we love designing and constructing world-class game scenarios, there is one game zone that will never change… Speedball. Speedball has been one of the most popular paintball games since paintball was first invented back in the early eighties due to it’s focus on high-adrenaline, fast-paced, close-quarters action. 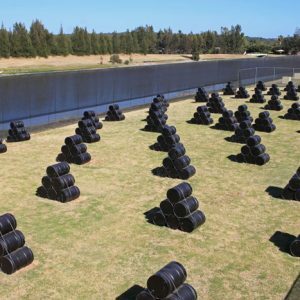 In professional paintball games, Speedball is usually played using inflatable bunkers but at Delta Force centres a Speedball field is comprised of a number of large and small bunkers made up of stacked oil barrels. 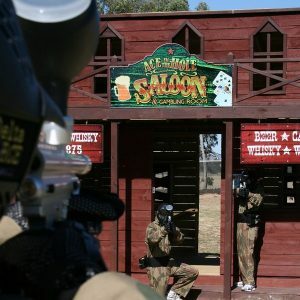 Those adrenaline junkies among our customers will be pleased to know that there is a speedball scenario at every Delta Force centre in Australia. There is only one game to play on a Speedball field and that’s ‘ Total Annihilation’ – the original way to play paintball. The aim of the game is simple – each team starts at opposite ends of the game zone and has to take out every member of the opposing team within ten minutes in order to win the round. Points are awarded to both teams in the event of a draw. Not only will you need great accuracy and manoeuvrability, but you’ll also need to work as a team and have a good strategy. Having plenty of ammunition doesn’t hurt either. Spread out and keep moving: ‘ Two to a bunker’ is a great rule of thumb to go by in any paintball game. Any more than two behind any bit of cover, no matter how large it is, will make it easier for the opposition to keep you pinned down and therefore out manoeuvre you. Keep your team spread throughout the game zone and keep moving forwards – although keeping spread thin and mobile may seem like a dangerous move, you’ll find it’s anything but. 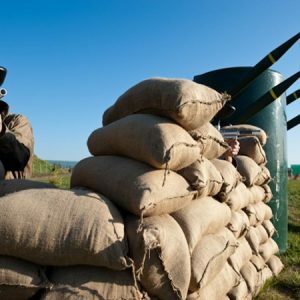 Flank or be flanked: Attacking from the flanks has been a classic tactic throughout the history of warfare for a reason – it produces results. Always keep up the pressure on the enemy’s flanks or keep yours heavily defended to prevent the enemy from doing the same thing. Maintain a balance between attacking and defending: Although it’s best to start off a paintball game aggressively, it can be difficult to maintain that kind of pace and you can even end up getting cut off from your team. Always keep in mind where your team stand at all times and where the weak points in your defence are and apply the same thinking to the enemy’s positions and their defence before you make any rash decisions. Use teamwork: Although you would think that using teamwork in a team-based game goes without saying you would be surprised at the sheer amount of games our marshals have witnessed in which every member of a team acts as an individual. Spend a couple of minutes before every game with your team discussing tactics and try to put together a game plan before the match starts. Hopefully these tips will help improve your paintball skills and give you the upper hand the next time you play on our Speedball field.